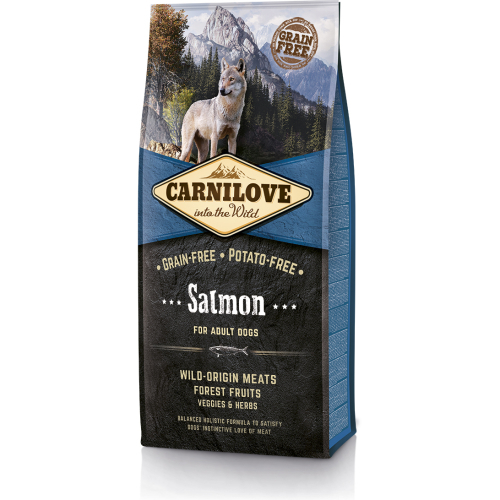 Carnilove Salmon Adult Dog Food is a delicious grain & potato free recipe for adult dogs of all breeds. Carnilove Salmon Adult Dog Food is easy to digest and has anti-inflammatory properties. It is also rich in omega-3 unsaturated fatty acids, which have a positive impact on mental development, the cardiovascular system, and metabolism (they reduce blood sugar levels). In addition to helping prevent degenerative eye disorders, salmon and its fat improve the quality and appearance of hair and skin. Crude protein 33,0 % fat content 16,0 % crude ash 8,5 % crude fibre 2,5 % moisture 10,0 % calcium 1,4 % phosphorus 1,1 %.